2011 January « GASTHAUS: got 'kraut? How true, how true….! In case you have never tried our desserts, because you have no room after dinner, perhaps you should start with dessert. It wouldn’t be a first at the Gasthaus. 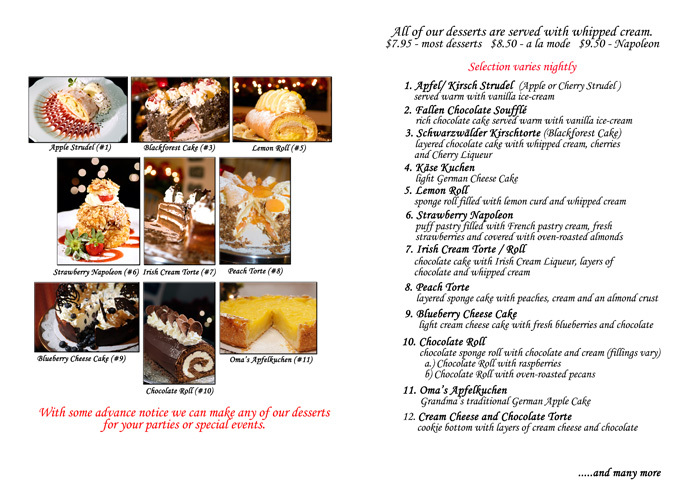 Afterall, how can you forget our desserts when we proudly present them as you walk in. On the other hand, if you would like to order some dessert for a special occasion (you know Valentine’s Day is coming up) and just don’t know what to order, you may view our newly designed menu right here. Please call 502-899-7177 to place orders. It’s Oscar’s time and I thought I’ll mention an interesting article on movies about food. Besides LOVE, a common theme among film makers is FOOD. Countless movies feature the subject, among them 2009’s “Julie & Julia,” starring Merryl Streep as Julia Child. 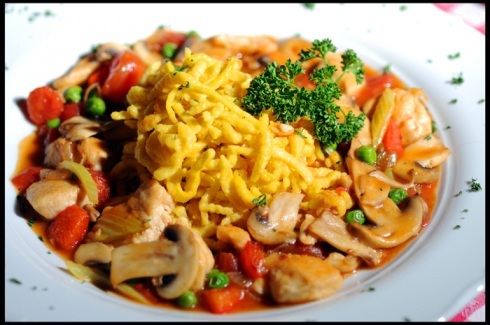 Allgäuer Cheese Soup – a soup with a blend of melted cheeses, ground beef, finely chopped mushrooms and onions….so yummy! We’ve had someone actually name it “Liquid Cheeseburger Soup”. That’s actually quite fitting. CLOSED Thursday, January 20, 2011 due to Snow! 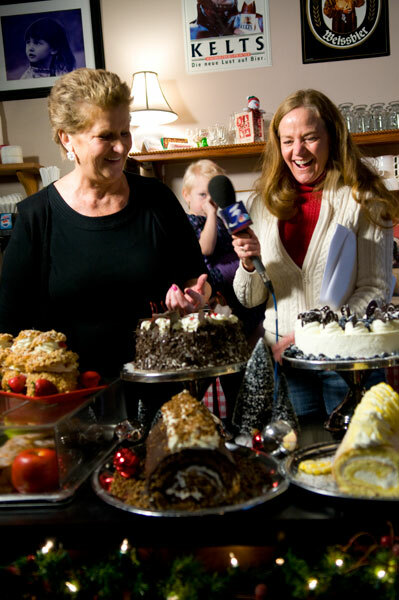 WAVE 3 Listens broadcast from the Gasthaus on December 21, 2010. Cindi Sullivan graced us again with her infectious laughter when she and her fabulous crew did a show at the Gasthaus back in December. 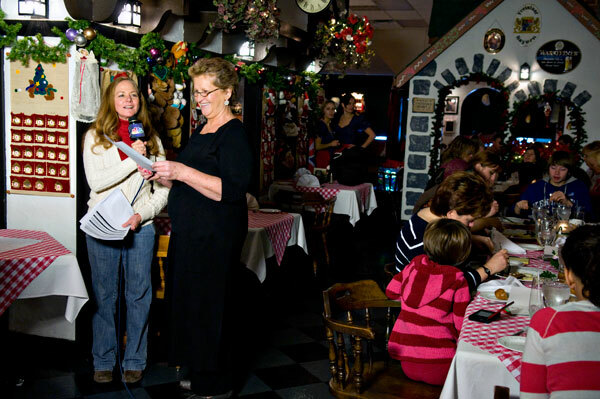 The live segment was not just about the Gasthaus and its food, but also about some German Christmas traditions and a game in which callers were asked to guess the meaning of German words with a Christmas meaning. While Cindi covered just about every corner of the restaurant, interviewing staff and others, our guests enjoyed a delicious Burgundy Roast with scalloped potatoes. Either way, enjoy the pictures below. Sorry, they are a bit delayed…. Annemarie explains her home-made desserts to Cindi. The selection of desserts varies nightly, but what you see here is the average amount of desserts available to chose from nightly. Olga, left, and Marina pose with Santa...who happens to be a regular guest at the Gasthaus...no, really! 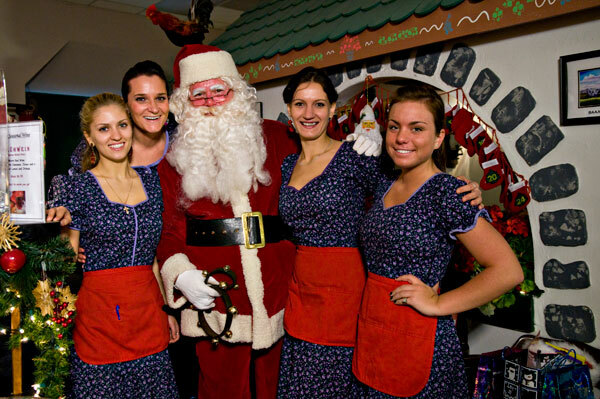 The Gasthaus staff, minus a few, poses with Santa. From left they are Olga, Viki, Marina, and Cicily. Annemarie demonstrates the making of Feuerzangenbowle, a potent drink served around the holidays. Cindi Sullivan interviews Sous-Chef Jason Malone in the Gasthaus kitchen, while Executive Chef J-P Schmitt listens. 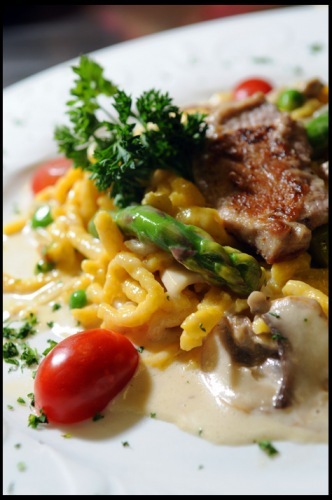 Vote Gasthaus for WHAS11 Best of Kentuckiana! WHAS11 is conducting the search for the best of in the next few weeks. We are running for Best Romantic Restaurant and hope you will vote for us! Please follow the link below and feel free to leave comments as you vote. We have Wilted Spinach Salad today and the rest of the week! 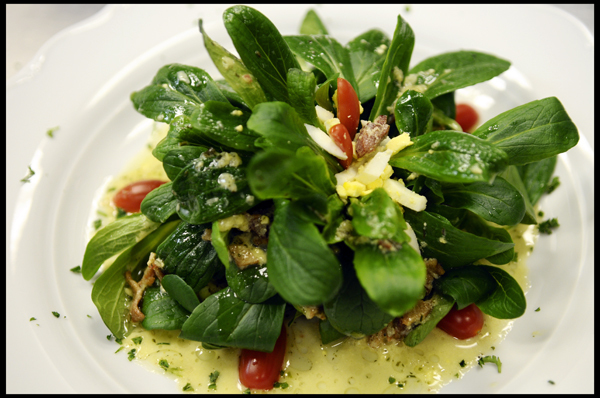 It’s Spinach tossed in a warm bacon vinaigrette garnished with pine nuts and cherry tomatoes! It’s one of our most popular salads!